Vittas: Morris has had a nice redshirt junior season as he’s transitioned into a role of exclusively relief work. He’s a big guy who throws downhill and has proven to be reliable and durable. Given his track record and good stuff, he deserves a pro opportunity, and should get one. But without a true plus pitch, Morris will have to prove himself at each level by commanding his pitches and working around hits. Lewis: Morris is a big durable LHP who has done a little bit of everything in his college career. 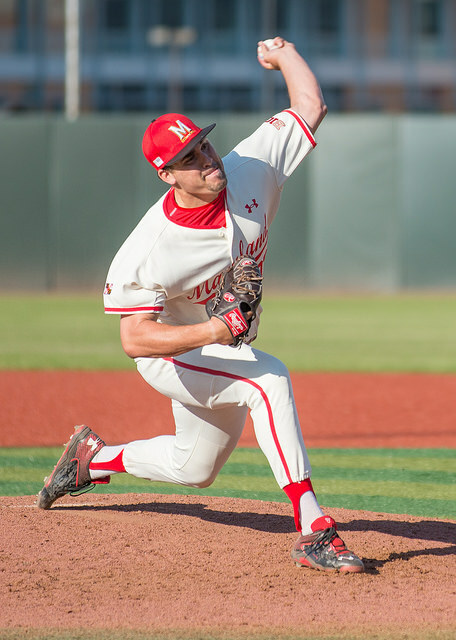 Whether it be starting Friday nights, pitching midweeks, or throwing meaningful innings out of the ‘pen during Maryland’s postseason runs, Morris has proven adept at pitching in many different situations. However, Morris profiles best as a middle reliever type moving forward where his fastball plays up. While it’s consistently in the 89-92 MPH range, Morris has been up to as high as 94 mph from the left hand side this year. He has clean arm action, downhill plane on his pitches and fills up the strike zone. While he doesn’t have a true breaking pitch, he can add and subtract with his fastball to keep hitters off balance. A LHP with his size, track record, stuff, and present pitchability should hear his name called in the middle portion of this upcoming draft. Be sure to return to our site tomorrow for the full breakdown of 2B Brandon Lowe. * John Vittas has been the play-by-play voice of the Maryland Terrapins and has called close to 100 games over the past four seasons. * Jon Lewis is a former college baseball player and provided live analysis on Vittas’ broadcasts. He is pursuing a career in professional scouting.